A truss is a structural frame relying on a triangular arrangement of webs and chords to transfer loads to reaction points. This geometric arrangement of the members gives trusses high strength-to-weight ratios, which permit longer spans than conventional framing. Light-frame truss can commonly span up to 20 m (60 ft), although longer spans are also feasible. The first light-frame trusses were built on-site using nailed plywood gusset plates. These trusses offered acceptable spans but demanded considerable time to build. Originally developed in the United States in the 1950s, the metal connector plate transformed the truss industry by allowing efficient prefabrication of short and long span trusses. The light-gauge metal connector plates allow for the transfer of load between adjoining members through punched steel teeth that are embedded into the wood members. Today, light-frame wood trusses are widely used in single- and multi-family residential, institutional, agricultural, commercial and industrial construction. The shape and size of light-frame trusses is restricted only by manufacturing capabilities, shipping limitations and handling considerations. Trusses can be designed as simple or multi-span and with or without cantilevers. Economy, ease of fabrication, fast delivery and simplified erection procedures make light-frame wood trusses competitive in many roof and floor applications. Their long span capability often eliminates the need for interior load bearing walls, offering the designer flexibility in floor layouts. Roof trusses offer pitched, sloped or flat roof configurations, while also providing clearance for insulation, ventilation, electrical, plumbing, heating and air conditioning services between the chords. Light-frame wood trusses are prefabricated by pressing the protruding teeth of the steel truss plate into 38 mm (2 in) wood members, which are pre-cut and assembled in a jig. Most trusses are fabricated using 38 x 64 mm (2 x 3 in) to 38 x 184 mm (2 x 8 in) visually graded and machine stress-rated (MSR) lumber. To provide different grip values, the truss connector plates are stamped from galvanized light-gauge sheet steel of different grades and gauge thicknesses. Many sizes of truss plates are manufactured to suit any shape or size of truss or load to be carried. Light frame trusses are manufactured according to standards established by the Truss Plate Institute of Canada. The capacities for the plates vary by manufacturer and are established through testing. Truss plates must conform to the requirements of CSA O86 and must be approved by the Canadian Construction Materials Centre (CCMC). To obtain approval, the truss plates are tested in accordance with CSA S347. During design, light-frame trusses are generally engineered by the truss plate manufacturer on behalf of the truss fabricator. When light-frame trusses arrive at the job site they should be checked for any permanent damage such as cross breaks in the lumber, missing or damaged metal connector plates, excessive splits in the lumber, or any damage that could impair the structural integrity of the truss. Whenever possible, trusses should be unloaded in bundles on dry, relatively smooth ground. They should not be unloaded on rough terrain or uneven spaces that could result in undue lateral strain that could possibly distort the metal connector plates or damage parts of the trusses. Light-frame trusses can be stored horizontally or vertically. 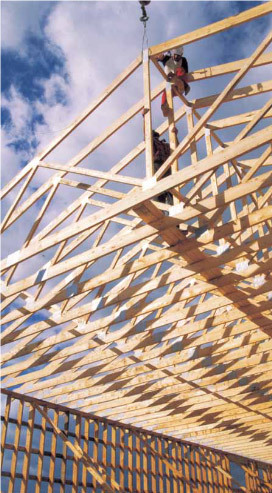 If stored in the horizontal position, trusses should be supported on blocking spaced at 2.4 to 3 m (8 to 10 ft) centres to prevent lateral bending and reduce moisture gain from the ground. When stored in the vertical position, trusses should be placed on a stable horizontal surfaced and braced to prevent toppling or tipping. If trusses need to be stored for an extended period of time measures must be taken to protect them from the elements, keeping the trusses dry and well ventilated. Light-frame trusses require temporary bracing during erection, prior to the installation of permanent bracing. Truss plates should not be used with incised lumber. Contact the truss manufacturer for further guidance on the use of light-frame trusses in corrosive environments, wet service conditions, or when treated with a fire retardant.